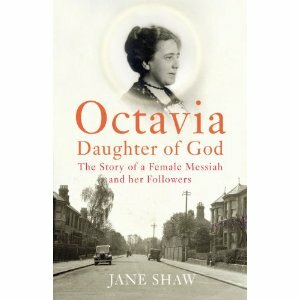 Just finished reading Octavia, Daughter of God:The story of a female Messiah and her followers. It tells the story of clergyman's wife Mabel Barltrop, who in the early years of the 20th century came to believe that she was to be the world's saviour, since in her eyes Jesus had not done enough in dying on the cross because sin and suffering still prevailed. The book is a fascinating piece of social and religious history which has been of particular interest to me since most of the activity of the book is centred on Bedford, the town where I grew up and still live. Living in and around Albany Road, a pleasant residential area of Bedford near the embankment, Mabel's followers gathered and gradually bought up several large properties throughout the 1920s. They created a garden between some of the properties that they really believed would be the renewed Garden of Eden. 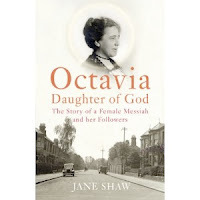 It's a salutary tale of misguided religiosity with an especially sad end to Ocatvia who died in 1934 aged 66 years from complications of diabetes. And since 'the whole raison d'etre of the Society is to get together those who will not die-those who are predestined to live'-her death was problematic. Indeed her followers gathered in her bedroom waiting for a resurrection after she died, only conceding the inevitable when post mortem changes were becoming unpleasant after 4 days. For a Christian like me it's a reminder that there is nothing inadequate about Jesus Christ and what he accomplished, but also how personal opinion and impressions from God have to be tested against the specific teaching and broad sweep of the Bible and also in consultation with other believers committed to the sufficiency of Scripture. I think one would have to say the the Panaceans were simply odd and I don't believe that followers of Jesus today should be known as such, on the contrary the apostle Paul exhorts Titus to 'make the teaching about God attractive in every way'. Attractive and challenging but not weird.